The perfect gift for chocolate lovers or a fabulous dessert centerpiece, the handmade chocolate basket is piled high with our hand-dipped cashews, dipped fruits, truffles and assorted chocolates. Or we can fill it with colorful chocolate almonds or plain nuts. After you devour the contents, either eat the basket or call us to refill it for another occasion. Available in various sizes: $27, $60, $80, $100, $150. For a dessert buffet, we offer a colossal basket for $650 which holds more than 20 pounds of handmade chocolates. Please call for details. 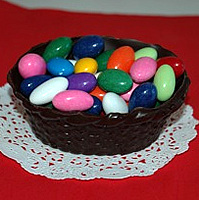 The Small Edible Chocolate Basket is the perfect little "thank you" gift. It looks best filled with our hand-dipped, jumbo cashews or colorful chocolate almonds. The basket weighs approximately 1/3 pound empty and holds approximately 1/3 pound of candy. It measures 4 1/2 inches wide and 1 3/4 tall. The basket's opening is about 3 inches wide. 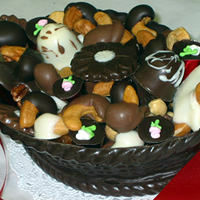 The Medium Edible Chocolate Basket is the perfect birthday gift or hostess gift. It can be filled with our hand-dipped, jumbo cashews, assorted chocolates, plain nuts or the candy of your choice. The basket weighs approximately 1 pound empty and is filled with about a pound of candy and nuts. It measures 7 inches long and 2 1/2 inches tall. The basket's opening is about 4 1/2 inches wide. 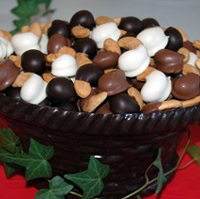 The Large Edible Chocolate Basket is a great addition to any dessert buffet or a wonderful gift to be shared in an office setting holiday time or any time. It can be filled with our hand-dipped, jumbo cashews, assorted chocolates or the candy of your choice. The basket weighs approximately 2 pounds empty and is filled with approximately 2 1/4 pounds of assorted chocolates or dipped cashews. It measures 8 ½ inches long and 5 1/4 inches tall. The basket's opening is about 5 1/4 inches wide. The Extra Large Edible Chocolate Basket is a great addition to any dessert buffet or a wonderful gift to be shared in an office setting at holiday time or anytime. It can be filled with our hand-dipped, jumbo cashews, assorted chocolates or the candy of your choice. The basket weighs approximately 3 1/2 pounds empty and is filled with approximately 4 pounds of assorted chocolates or dipped cashews. It measures 11 1/2 inches long and 6 1/2 inches tall. The basket's opening is 7 inches wide. Note: The edible baskets are always made with our bittersweet Belgian chocolate (pareve/non-dairy). The contents can be an assortment of your choice. Each basket is made-to-order so call us directly at (781) 784-5193 if you'd like to customize your basket's contents.